The air is so thick and sticky I’m pretty sure I could spread it on toast. Why does my mind always go to food? Don’t answer that. It was rhetorical. I’ve been hanging out more in grocery stores, even on my day off, to try and keep cool. As I type this my fingers are sticking to the keys of the keyboard. True story. It makes it especially hard to type. Because winter is over and because I’m spending more time in air conditioned buildings than usual I have discovered that asparagus has gone on sale. Oh. Yeah! I love love looove asparagus. I steam it then cover it with a big glob of butter and a sprinkle of seasoned salt and my taste buds do a million happy dances. So I need you to understand how precious asparagus is to me. Here’s the equation. Asparagus price = too high. 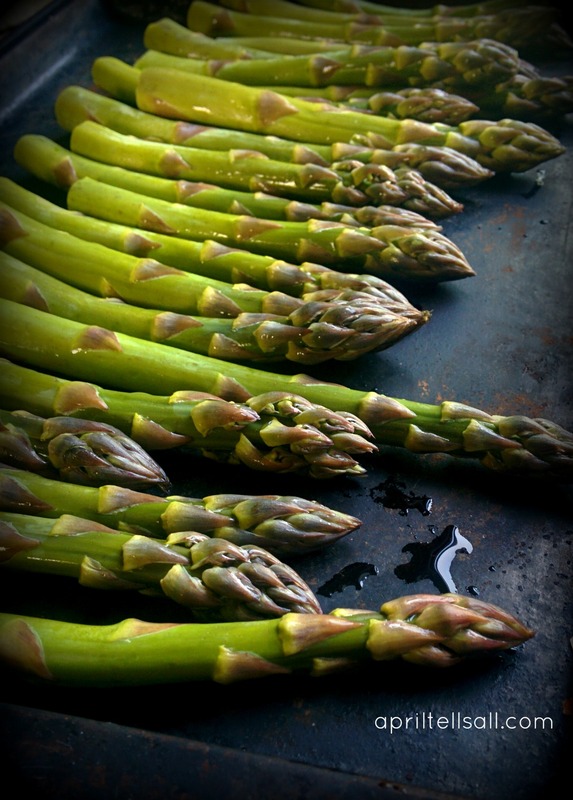 Steamed asparagus = win every time. 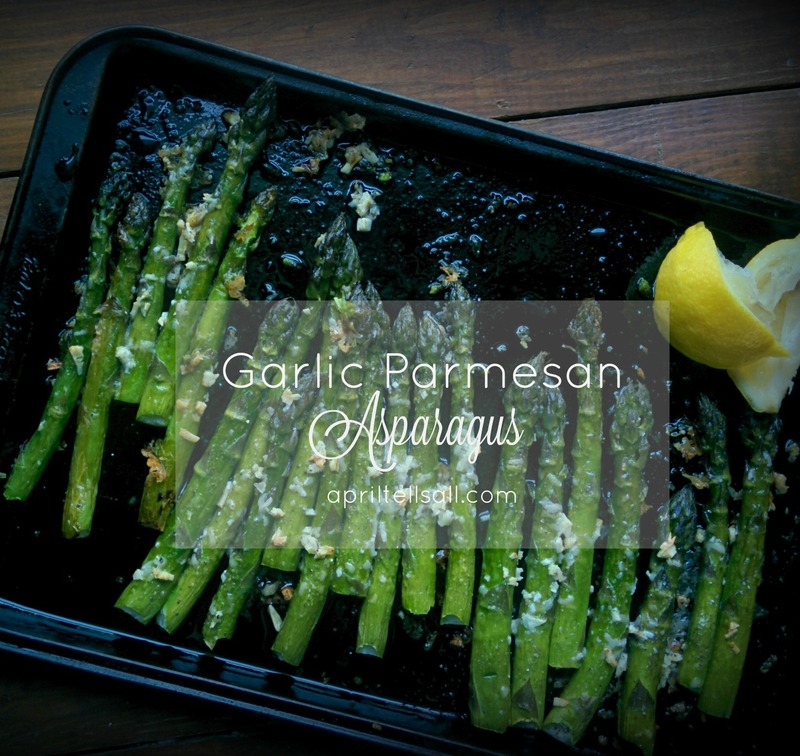 New recipe with asparagus that might turn out to be terrible = too much risk. April gets asparagus maybe 4 times in an entire year. If I’m going to make it, it had better be good. So take the fact that I’m sharing this recipe as a good sign. Because oh lardy! It may have just replaced my butter drenched steamed asparagus. Maybe. Step 3: Place the asparagus on a cookie sheet. See how easy this is? You’re practically done! Step 4: Mince the garlic really really reeeally well. Mince I say, mince! 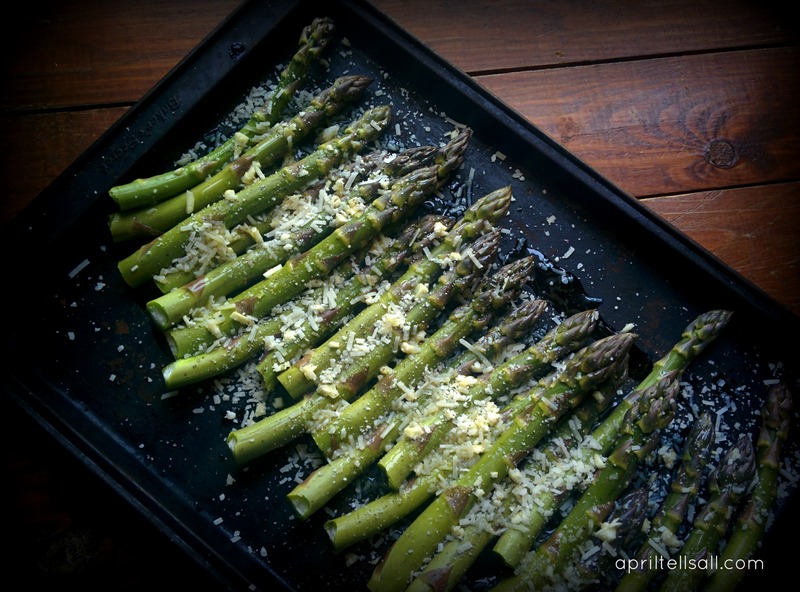 Once minced sprinkle on the asparagus. Step 5: Sprinkle with salt and pepper and the Parmesan cheese. Step 6: Drizzle the olive oil over top. Step 7: Roast in a preheated oven for 10 – 12 minutes or until fork tender. 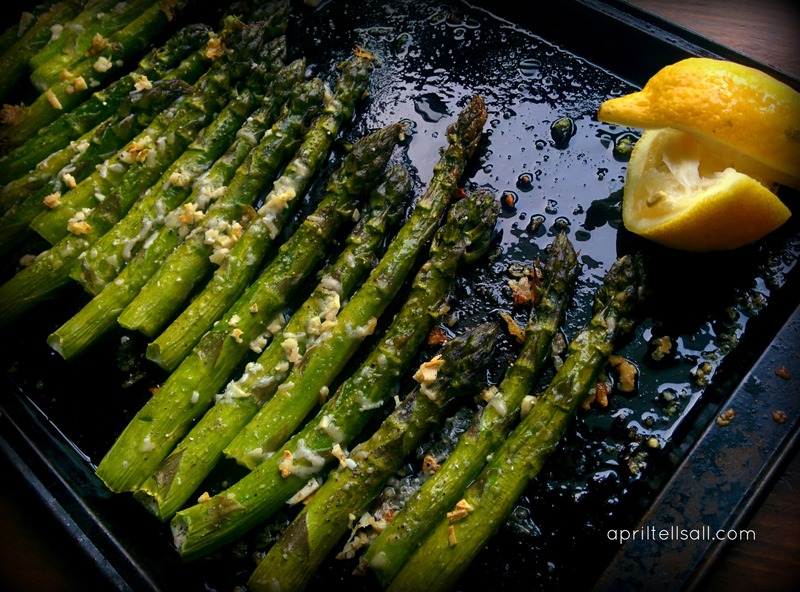 Step 8: Remove from the oven and squirt fresh lemon juice over the asparagus. TRUST ME ON THIS! Sorry. I didn’t mean to yell but I am very passionate about this step. It makes the flavours pop and it is divine. I highly highly hiiiighly recommend fresh lemon here. Enjoy along side a salad and grilled piece of salmon. Seriously delicious. Seriously. I’m highly serious when it comes to food. I’m also highly serious when it’s so bloody hot the space bar is stuck to my thumb. For reals. Now eat. And enjoy. And if you have air conditioning I’m seriously (there’s that word again) jealous. Or rain. Rain would be good too. The rain barrels are empty here which means the animals go thirsty. I steal water from my neighbour’s hose because she’s gone for a week. Shameful. But a goats gotta drink. Ok enough rambling. Make the asparagus.